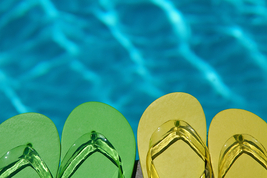 Pool Openings & Closings - Macomb, Shelby, Clinton Twp., Sterling Hts., & More! Our own employees will be sent out. No Subcontractors. We employ service technicians who are industry veterans with many years of experience. Our service technicians will be happy to answer all of your questions. If you chose a Complete Pool Opening, we will do everything from taking off and cleaning the cover, to doing an initial cleaning of the pool and/or spa. "A very thorough job." You will feel safe knowing industry veterans who know how to close a pool perform the work. Plumbing lines and equipment will be guaranteed for the winter. You will be receiving the best quality products. You can rest assured knowing that the finish of your pool or spa will not be damaged by inferior chemicals. Prepare your pool for the upcoming season. Call 586-566-4600 today to schedule your pool opening or closing.